On one recent trip to the Gulf Coast, I was told that our hotel was pet-friendly, so I asked no further questions before the long drive. Upon check-in, I’m not sure who was more surprised: me, to learn the hotel had a 25-pound weight limit for pets, or the valet, to see my full-grown pit bull panting in the backseat. After some initial awkwardness and excellent customer service, Lucy was safely upstairs in our room—probably the only pit bull to grace the halls of that historic property. To save you the same awkwardness on your own adventures, I’ve rounded up my favorite pet-friendly accommodations across the Lone Star State. Thanks to these hip hotels, you won’t have to leave your best friend behind on your next vacation. Designed in 1927 by the same architect as the Gage, Henry Trost, the Holland Hotel in Alpine has almost the same pet policy: $30 fee, no weight limit. Leashed pets can even join you for dinner on the enclosed lobby patio, where you can sip margaritas and enjoy a burger from the Century Grill. One of Austin’s most chic hotels is also one of its most pet-friendly, with dogs up to 50 pounds allowed almost anywhere (besides the pool). With no fee for up to 2 dogs per room, the hotel provides bedding, bowls, treats, and waste bags. This retro boutique hotel goes above and beyond to recognize the most important members of our clan with its Furry Family Members Package. For $50, guests receive a pup welcome amenity and a $10 credit toward the mini-bar. Dogs deserve a day at the beach, too! The beachfront Galvez allows pets up to 25 pounds for a $100 fee, and the Seawall may just be the most scenic place to walk a dog in Texas. This newly built retro retreat invites guests to check in with up to two pets under 50 pounds for a $50 fee. Lake Carolyn is adjacent to the hotel with 190 acres of parks for playtime, and Irving has over more than 40 dog-friendly restaurants. Out in the Hill Country, Walden Retreats is a 96-acre luxury camping haven along the cliffs of the Pedernales River—the perfect place to get away with your favorite hiking companion. One dog per room is welcome for a fee of $30 per night, and must be leashed outside. With advance notice, the resort can provide first floor rooms for easy outdoor access. Pets under 60 pounds are allowed for a $100 fee, and lush green areas are an added bonus at this luxury getaway. Take your pup on your next trip to West Texas with a stay at the Gage, where the 27-acre Gage Gardens’ walking trails and open spaces are the perfect place to play after a lengthy drive. 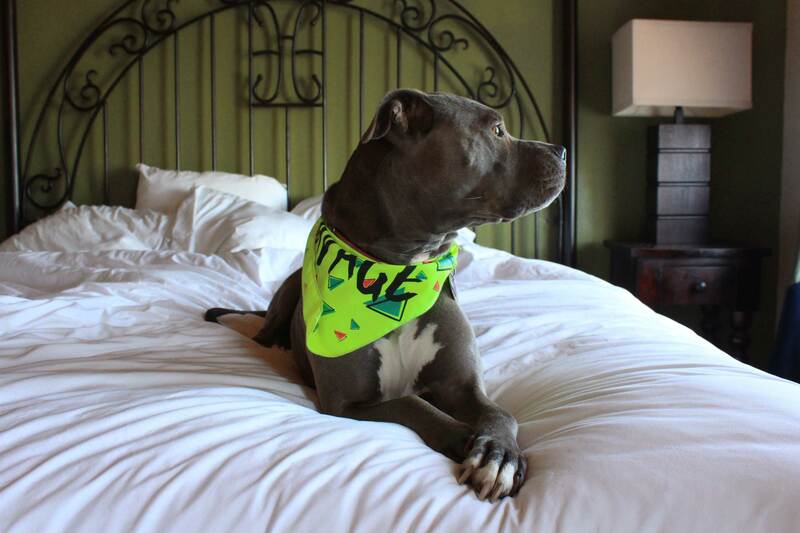 Specific rooms are designated as pet-friendly, and the hotel provides bedding, bowls, and treats for a $30 pet fee. Just a little further west, one of the most popular getaways in the canine world is Liz Lambert’s laid-back El Cosmico. There are no weight limits for big-boned girls like my Lucy, and it’s only $10 per dog, per night. One thing to note: Desert temps can drop below 32 degrees at night, so bring extra blankets if you book one of the Safari tents. Even our dogs need to remember the Alamo. This River Walk staple allows pets up to 50 pounds for a $100 fee, and Travis Park nearby is a great place for quick relief.